VX22347 LAMB, GEORGE HAMILTON. Submitted by Tony Lamb OAM (son). Background : The following is an address Tony Lamb OAM (Former MHR and son of Hamilton lamb) to the Australasian Study of Parliaments Group in Victoria at Parliament House, Spring Street, Melbourne, Victoria on Remembrance Day 11th November 2009. The influences that saw Lt. Hamilton Lamb MLA become the only sitting MP to die for Australia in World War Two. I feel honoured to talk to you on this Armistice Day when we remember those who served and died at war for Australia and the Commonwealth. In particular I wish to illustrate their service and sacrifice through the story of my father, Hamilton Lamb, the only sitting Australian MP to die in World War 2. My father was not unique in enlisting for war service. The booklet, The Parliament of Australia Remembers (prepared by D. Babbage for the Victorian Parliament, 1995 [Law Printer, Melb.]) marked the 50th Anniversary of VP Day, 15 August 1945, by listing some 117 Victorian MPs who served in WW2, including one winner of the Victoria Cross in WW1 - Major William `Rusty' Ruthven, MLA for Preston and Reservoir. Of those 117, ten served in World War 2 while they were sitting MPs. Some served within Australia, others overseas such as Tom Hollway with the R.A.A.F. in New Guinea and Wilfrid Kent Hughes who, like my father, was a Prisoner of War of the Japanese. I also learned a few years ago from Winston Peters, the former New Zealand MP, that five NZ MPs lost their lives on active service during the Second World War. Also I wish to thank once again, the Hon Judy Maddigan, who as Speaker of the Legislative Assembly arranged in 2003 for a memorial seat in dad's honour to be set up on the parliamentary grounds near the bowling green and not far from the tennis court on which he played so often. A number of his comrades on the infamous Burma Railway attended the ceremony. Recently I attended a lecture at the National Library by David Day, the well-known biographer of politicians including those of Fisher, Curtin and Chifley and an historian of Australia's involvement in WW2. Early in his address he emphasised the need for the biographer to explore the early years of life of the subject for it is during this period that the values, character and personality of the individual is largely created and established. He warned the audience to examine how much of a biography was devoted to this period and if it was less than several chapters not to bother as it probably missed the most important contributions of the character in question. Guided by David, I will outline the events which led to Hammy Lamb enlisting and travelling from Wimmera, to War. George Hamilton Lamb and his twin sister Florence were born in Bendigo on the 1st January 1900. After a short time in inner Melbourne their parents, Sarah and William, trained as teachers and were posted to different one-teacher schools in Victoria. This meant that Hammy's father was away from the family most of the year during school terms. During these informative years their mother taught them the rules of life and fairness. While recognising the accepted roles of males and females within marriage and society she also expressed the need for partnership and sharing in life. They shifted twice to small schools in the Wimmera absorbing the ways of rural life in small towns and on the farms. As a teacher, their mother was required to foster in the minds of her pupils the sentiment of love of country, respect for its laws and loyalty to the sovereign. The ties to the mother country and the Empire were strengthened by exposure to the literature of Rudyard Kipling and to the heroics of General Gordon of Khartoum and Lord Kitchener. While mildly conservative, the politics of Lamb's parents were those of Deakin's Liberalism - which he expressed at Ballaarat in 1905 endeavouring to show that neither socialists nor anti-socialists complied with the needs of the electors. Labor was not seen as an enemy at that time by Deakin and he worked closely with that party to create minority governments through a parliamentary alliance of convenience and to keep the conservative George Reid out of government. Moreover, Deakin believed in social justice attained through progressive measures and free use of the State to achieve those ends. Proof of these influences on Lamb's life can be seen in the writings of his own father when he became editor of a local newspaper from 1914 when the family moved to Stawell, for the twin's secondary education at Stawell High School, a few months before the outbreak of the Great War. The twins were very close and developed a strong sense of telepathy, sharing experiences and understanding even when apart. The next few years of that war would be a great influence on the political development of the teenager Lamb as would the political conservatism of his parents. Being brought up in rural areas, up till now Lamb had not experienced the Boy Scouts Movement nor the school cadet corps which reinforced traditional Britishness in the young men living in the cities and larger towns. He was now required to undertake at least 64 hours of annual training in the senior cadets. Being just 15 and the only boy in the family he was not expected to enlist, even towards the end of the war. While the two referendums for compulsory conscription were rejected, support for it in country areas was strong and he would have felt the pressure to enlist especially as many of his school mates, neighbours and men on the land did so - many not to return. The noble example of self-sacrifice was institutionalised as soon as possible in 1916 when the first observance of Anzac Day was held in all schools on Maundy Thursday, 20th April, the day before the Easter holidays. Stawell High School's ceremony was reported in the local paper. Hamilton Lamb attended 109 hours in the year ended June 30th 1915 as a senior cadet in the Stawell and Ararat Commonwealth Senior Cadets (Area 73c), continued on and after an examination in August 1917 was awarded his Sergeants Certificate in the 73rd Battalion Senior Cadets of the Australian Military Forces, two months after his 18th birthday. Another personal pressure during this time would have come from his mother's active membership of the Australian Women's National League and his father being a hard worker in the interests of the Nationalist Party through his job as editor of the Stawell Times. His father, being editor of the local paper, meant that conversations at home covered local, state and federal issues more than most and the city based papers were widely read. The Stawell News encouraged voluntary enlistment in every issue employing stories of the war heroes, their awards and deaths, especially of local soldiers and printing their letters to home. When federal Labor split and Hughes formed the Nationalist Party, the Lamb family transferred their loyalty to the Nationalists and this ensured that party received better local coverage than Labor. Another factor was the large German-born population in the Wimmera. Although some enlisted, the anti-conscription vote increased slightly at the second referendum. The German farmers were blamed although the anti-vote was affected by its timing - right on harvest time when men were needed on the land. Lamb's mother wrote several letters to the editor urging women to have at heart the true welfare of the mothers, wives and children of the men at the front. 'Vote yes for Empire, brave France and poor bleeding Belgium.' There is no doubt in my mind that this would have had an impact on Hamilton Lamb's volunteering in WW2 as he witnessed the loss of school friends, some who had lied about their age so as to enlist and neighbours at war and would have pledged to himself to enlist should war ever break out again. His four years in Stawell during the First World War had been an incredible period of electoral activity. He had witnessed three to four years of intense campaigning and his household's total involvement in those campaigns. The Victorian Farmers' Union, fore-runner of the Country Party, had emerged as a political participant, if not yet a force, at state level and soon to be at federal level. More lay ahead for the young man of the Wimmera who was headed for Melbourne University. He would become part of the reserve that backed the 'Diggers of Anzac', the new national heroes and embodiment of Australian manhood. He fulfilled his military training obligations by joining the Melbourne University Rifles (MUR) which a few years earlier had included, concurrently in the same unit, two future main players in federal and state politics - Arthur Calwell and Robert Menzies. He enjoyed the training, played Australian Rules Football for the MUR and was promoted to Corporal in mid-1921. Then he undertook two years of Compulsory Citizen Force training followed by a further six years in the Compulsory Reserve Force whereupon he rose to Captain. Hamilton Lamb studied Law and the Arts, graduating with an Arts Degree and joined the Education Department, teaching, like his parents, in small single-teacher schools in the Wimmera. He then moved to Geelong where he was the founding principal of the Geelong Grammar Preparatory School, now known as Bostock House. His father died in 1926 and Hamilton assumed the primary responsibility of caring for his mother and sister. After a few years he became a lecturer in English and Economics at the Gordon Institute of Technology also at Geelong. Here he met William Rodan and introduced him to his sister. They married and Hamilton was free after eight years to marry his fiancee, Christine Marie Schultz, daughter of a second generation Australian-German farming family at Glenlee near Nhill in the Wimmera. He had first met her while teaching Marie's younger brothers at a country school. She had been one of the first to matriculate from Nhill High School and was a teacher at primary schools in the Northern Wimmera. They moved to Kyneton where he was principal of Kyneton College and started a family. From all the bitterness that marks the day. Lamb entered the Victorian Legislative Assembly in March 1935, defeating another Country Party candidate, the sitting member Marcus Wettenhall who had held the seat for 15 years. He had been recruited by the president of the Country Party, Bert Hocking, in an endeavour to introduce younger members and a swing away from the link with the conservatives. Lamb's vote was crucial in Dunstan displacing Bourchier as leader of the Country Party and his elevation to Premier. This support was not to be rewarded despite early indications it would be. While Lamb's politics were close to Labor, helping to cement that relationship, Dunstan found Lamb's idealism and detail of legal niceties frustrating. A battle emerged between the Premier and the Party President as to who controlled the Country Party. When Lamb supported Hocking on legal grounds after the Premier had dismissed Hocking as a Commissioner of the Board of the State Savings Bank, Dunstan decided he had had enough of Lamb's rebelliousness. The Premier put up his own candidate against Lamb in Lowan at the March 1940 election but Lamb won easily as did his comrades in the Northern Victorian area. They were labelled the "rebels' and the `Mallee Hens.' When Lamb and his ally Albert Allnutt were elected to the Party's Central Council against Dunstan's preferred candidates the die was cast. Lamb could see that while Dunstan was premier he would not gain promotion to the Ministry and be Minister for Education, the post he wanted. Lamb pondered his future. He now had three very young children and his wife was in ill health. He had drawn closer ideologically to the Labor party which supported the minority Dunstan government and conferred regularly with another Country Party rebel, Alex Wilson MHR for Wimmera. Perhaps federal politics was his way forward. He had spoken in parliament about the morals of government conscripting men for war, arguing that capital should be conscripted too instead of companies like BHP making huge profits from war. Perhaps those who sent men to war should be prepared to go themselves but that was the responsibility of the federal parliament not the states. The war in Europe had been going six months and anti-German feelings were being stirred again in Western Victoria, led by the federal UAP member for Wannon, Tom Schofield. Having married into a German family, this may have been a factor in his thinking that Schofield's campaign may be used against him in his electorate. But the reality was that members of his wife's extended family had served in the Great War and enlisted since the outbreak of the Second World War. Hamilton Lamb decided to join the army. The Victorian Parliament had cleared the way to allow MPs to enlist. If an election took place while they were away, it was generally agreed they would be re�elected unopposed. He had always spoken out against war claiming that the true message of Anzac was the abolition of war. He was a realist and echoed the lessons he had learned at home during the First World War. The R.S.L. and others misunderstood this message even though 'Labor Call' reported him as also saying - 'God forbid that I should stand opposed to the defence of the country or that I should scoff at the righteous appeals of a weaker nation.' He was not the favourite son of the R.S.L. either when that body had incorrectly judged him over statements he had made about preferred employment for returned soldiers. So it was that in June, three months after his re-election, he passed his medical, became a thirty-niner when he lowered his age and enlisted as private VX22347. The next year was spent with the 2/2nd Pioneers at Puckapunyal with the occasional leave home and to parliament house. His wife Marie died early in 1941, his daughter not one year old. He entrusted his wife's family and his twin sister to ensure that his children were brought up and cared for while he was away and should he not return. Like other Australian men he was going to war to protect them and to fight for the freedom of families in other countries. He also arranged for fellow MPs in neighbouring electorates to share responsibility for servicing the people of Lowan. Lt. Hamilton Lamb left Australia on the Queen Mary in early September 1941 bound for the Middle East. He soon heard of the change of federal government in Australia, when his good friend Alex Wilson had voted with the Victorian Independent Arthur Coles to install a Labor government with Curtin as Prime Minister. On the final train trip from Melbourne to his embarkation at Sydney, he had discussed with Wilson the future of the federal government and had urged him to stick to his intention to cross the floor. They both saw Fadden as a 'cheap opportunist.' Maybe, on his return from war service Lamb would stand for federal parliament. Japan entered the war in December 1941 when it attacked the U.S. Navy in Pearl Harbour and invaded South East Asia. Australia readied itself for attack and recalled its forces from the Middle East. What happened over the next few weeks would determine the fate of the 2/2nd Pioneer Battalion. 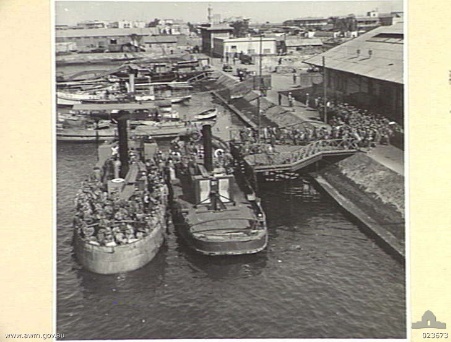 On the 1st of February Lamb and his men aboard the S.S. Orcades left Port Tewfik assuming they were being sent to defend Australia against a feared Japanese attack. What they did not know was that Curtin and Churchill were arguing over where the Australian forces should be stationed, the British arguing for Burma and Australia demanding that they join with the United States to direct the Pacific campaign. Earle Page tried to soften the situation by acting as a go-between, Churchill angry that Curtin had 'sided' with the U.S.A. over Britain. The Orcades headed towards Java as the indecision continued. Singapore fell in mid-February and Churchill directed the ship, now off Colombo, towards Burma. Curtin declared that Australia, not Britain, commanded her troops and demanded that the men return to Australia. Back home some electors were campaigning to have Lamb brought back home to personally serve his electorate. The Orcades turned around and berthed at Batavia. They disembarked then embarked only to disembark again. Just 24 hours decided the fate of Lamb and his men landing in Java or returning to Australia. They learned that the Japanese were on Java and were ordered to relieve the Dutch forces and the bridge at Llewiliang. After three weeks defending Java, Lamb and his men received the order to surrender. Now they were prisoners of war. The men were returned to Batavia and at the end of March shifted to the so-called Bicycle Camp where they were interned for the next six months. 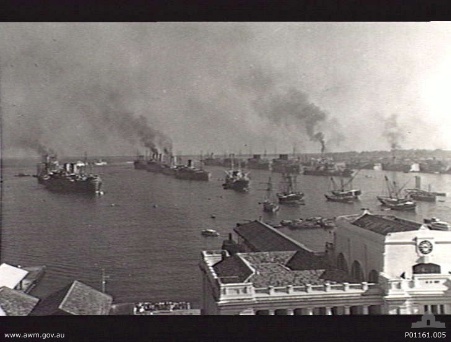 Then they were packed tightly into a ship and taken to Singapore where they stayed for a short while at Changi before heading for Rangoon, the capital of Burma. Lamb and his men were to start building the Burma Railway at the Moulmein end while those in Changi built it from the Bangkok end. A year later, under oppressing conditions and the men wracked with malaria, dysentery, and ulcers, the railway was completed 145 kilometres from Thanbyuzayat. Lamb was facing death. Beriberi, malnutrition and malaria had taken their toll. I'll turn to Owen Heron, a young orphaned member of my father's unit, to tell the final story. He is still alive today. `There was only one officer who stood out for me, and he died there. I do wonder if he had stayed low like the rest whether he might have made it; who knows? But he died of dysentery. Hamilton Lamb was his name; he was a down to earth country fellow from around Horsham way, in Victoria. He was a member of parliament as a matter of fact. He was with us until about the 60 or 65 kilo camp. He was a good officer; he would speak to you civilly and as a friend. I think perhaps he was one of the few who realised we were all in it together, and that together we would get out of it. The only time I visited a hospital at all was when Lieutenant Hamilton Lamb was sick in one. They had two huts for the sick in whatever camp it was, and he would say, 'I don't want to go into that other hut, because I know if I do I won't come out; it will be the end of me.' There were no illusions up there, and he was right: no one would want to go into that other hut, because you wouldn't come out, and he didn't. No sooner did he say that than, next day, he was shifted. We got bananas for him; don't ask me where we got them, but it was too late: it didn't do any good. The poor devil died there. (Reference Pattie Wright, The Men of the Line, (The Myegunyah Press, 2008) p220-1 Interview with Owen Heron). My dad died on 7th December 1943. Such was the poor communication along the line that it was not for three months, yet only 50 to 100 kilometres along the line, that Weary Dunlop was able to write in his diary that Hammy Lamb was among those who have died as P.O.W.s. Thousands of miles away in Horsham, within the hour, Florence woke up her husband and told him that something terrible had happened to her twin brother, such was their telepathy. Years later when the men returned home they confirmed her experience. Official word of his death did not reach Australia until seven months later on August 24hjust five weeks after Florence had lost her husband to lung cancer. She was devastated and the Victorian parliament had lost one of their numbers to war. Wilfrid Kent Hughes would not return for almost another year. She and her husband, Bill, moved to Horsham in 1940. She became active in the Women's Section of the Country party, the Womens' Christian Temperance Union and was president of the League of Women's Voters. In Hammy's absence overseas on active service, Florence took on his political interests, attending to local matters. After her brother's death, on being approached she briefly considered nominating for Lowan, until she heard and honoured his will request that his campaign manager Mick Mibus follow him. She learned early that women were not encouraged to be active politically in the Country Party, particularly at parliamentary level. Florence did run as an Independent for Boning after Lowan was redistributed but was unsuccessful. She stood for the Horsham Council twice, the first woman to do so. Without a breadwinner in the home, Florence began the struggle to raise six children, all under 16 and at school. To add to her distress and responsibility, her mother, on hearing of her only son's death, suffered a slight stroke leaving her movement restricted and she moved back to Horsham where she could receive personal attention and support. Her only relief was when my mother's family on the farms or in Nhill looked after us on school holidays or when Florence was in hospital. They were most supportive. I have no doubt that it was my father's legacy and my Aunt's encouragement to be involved which tutored my interest in politics and my campaigning at State level in 1964 and 67. This led to my entering federal parliament in 1972 with Gough Whitlam and later, after a break, my time with Bob Hawke until March 1990. I have always encouraged my former parliamentary colleagues to write their life story and what motivated them to enter parliament. Each one has so much to tell and share. I have just finished reading 'Living Politics' by Margaret Reynolds (Reynolds Margaret, Living Politics UQP 2007) a former Senator and Minister in the Hawke government. She learned to be a feminist and did much for the disabled and for the human rights of Indigenous Australians. Perhaps it is time I wrote a book about the life of my father.